I read this article and found it very interesting, thought it might be something for you. 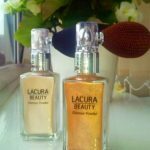 The article is called Lacura Beauty Glamour Powder Review and is located at https://homemademasks.net/beauty-blog/makeup-reviews/lacura-beauty-glamour-powder-review/. This product is among my favorites! Not for nothing they called it “Glamour Powder” it is absolutely gorgeous & glam! I loved it so much that I purchased two: “Diamond Glow” and “Shining Gold”. The packaging is lovely as it resembles with a perfume bottle from the 30s. Also the way it is designed, only makes it practical and easy to use when sprayed on my face and body. It has a subtle refined smell to add to my nice experience when adding that finishing touch to my make-up. I use it every time on my face, along the cheekbones to add glamour and it creates the look that goes so well with sunny summer days. Just remember to avoid spraying it into your eyes – I take care in closing mine as it already happened once and it wasn’t pleasant ;). As every other Lacura cosmetic product, is at a really affordable price. I just purchased the gold version: “Shining Gold” the other day with just £ 2.99 (was on sale from £ 3.99). So yeah, the prices for these lovely cosmetics from Aldi are amazing. Would I repurchase this again? Of course I will & hopefully they will make them forever!